LOS ANGELES (AP) — Mayor Antonio Villaraigosa on Friday forecast a long season of painful budget cuts that will shutter city departments, force layoffs and potentially slash salaries for police, firefighters and other city workers. Over the next 16 months, the nation's second-largest city needs to close spending gaps of about $700 million as the economy struggles with double-digit unemployment and a housing crisis. As early steps, the Democratic mayor announced he would eliminate two small agencies to save $3.2 million. "I don't relish having to make these decisions," a grim-faced mayor said at City Hall. "We are going to have to cut everywhere." The City Council and the mayor's office have been discussing plans for weeks to shutter the departments of Environmental Affairs and Human Services, which will cut 46 jobs. Villaraigosa said most of the functions carried out by the agencies would be shifted elsewhere. But he sees no scenario that does not include future layoffs and "you can't lay off people ... without reducing the size of services." Earlier this month, the mayor announced 1,000 planned layoffs to help close a $212 million budget gap by June 30. With the city's finances continuing to erode, the Council directed agencies Thursday to cut 3,000 additional jobs by that time, a move supported by the mayor. If completed, the layoffs would cut the work force paid from the city's general fund by 16 percent. Overall, Los Angeles has 46,000 workers, but 21,000 are paid from separate sources, such as at the Department of Water and Power. The gap projected for the year that begins July 1 is nearly $500 million, all but assuring further cutbacks. 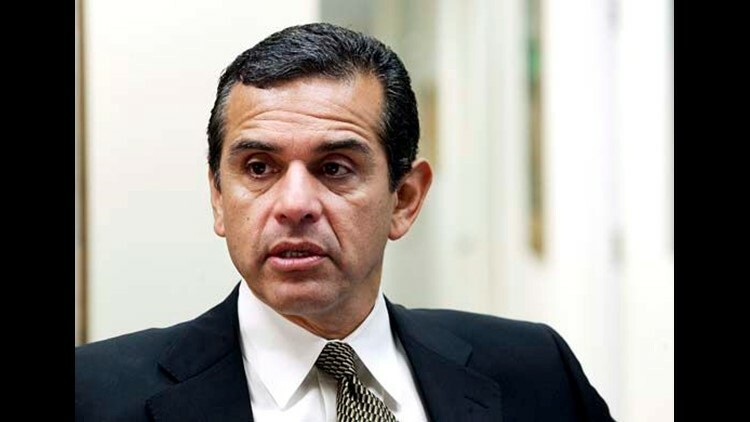 "There is no scenario where there will not be layoffs," Villaraigosa said. Villaraigosa opposes police layoffs — he's made expanding the police ranks a cornerstone of his administration. But he wants unionized workers, including police officers and firefighters, to consider pay cuts as deep as 15 percent, which would save as much as $450 million a year. Police union president Paul Weber said officers agreed in their last contract to be compensated for overtime for a two-year period in time off, not cash, to save the city money. "We understand the city is in a dire-type financial situation," said Weber, who heads the Los Angeles Police Protective League. But "I think my average member is going to say, 'I'm already taking a pay cut.'" Cheryl Parisi, chair of the Coalition of Los Angeles City Unions, an umbrella group for 22,000 workers from librarians to street maintenance workers, faulted the mayor and Council for poor financial stewardship. She said other options should be considered, including givebacks from vendors with $2.5 billion in city contracts. "There has been no real leadership. There has been no plan," Parisi said. The city's financial outlook is not promising. Los Angeles County lost 154,000 jobs in 2009 and is projected to lose 20,000 this year before growing by 40,000 in 2011. "It's going to be a slow recovery," said Jack Kyser, chief economist with the Los Angeles County Economic Development Corp. "It's going to be a tough time for local governments."